Dr Gebisa Ejeta ( above) of Ethiopia (currently at Purdue University in the USA) is the first sole African recipient of the World Food Prize( 2009) established by Dr Norman Borlaug to honour those who demonstrate passion and promise to fight world hunger. As I write this editorial, I am attending the Sasakawa Africa Association Symposium in Addis Ababa (July 12 to 14, 2010) organized to honour Dr Norman Borlaug (left) who died on September 13, 2009 at age 95. Ethiopia is key to Dr Borlaug because that is where he started his work in Africa in 1986 and established Sasakawa Global 2000 under which Sasakawa Africa Association operates, together with the late Roichi Sasakawa and Jimmy Carter, former president of the United States. The Borlaug Symposium in Ethiopia was a great event, well attended, addressed by the Ethiopian Prime Minister, attended by Former President of the USA Jimmy Carter and his wife Roselyn and graced by Yohei Sasakawa (son of the late Roichi Sasakawa),who is also chair of the Nippon Foundation of Japan that was the sponsor of the Symposium. Participants were drawn from both well known and little known actors in Food security and agriculture in Africa, at policy, academic and agricultural research institutions. FARA, AGRA, Bill and Melinda Gates Foundation, Winrock Foundation, AATF, CIAT, IFDC, the Carter Center, ICRISAT and government delegations from Mozambique, Nigeria, Uganda, Tanzania, and Ethiopia of course were present. Well, I also attended in my capacity as one of the newest members of Trustees of the Sasakawa Africa Association and also representing my small NGO Rural Outreach Program (ROP) and African Journal of Food, Agriculture, Nutrition and Development (AJFAND). The Program started with formal speeches by key personalities (Remembering the Life of Norman Borlaug, the Father of the Green Revolution, which Norman himself referred to as “ a miserable term”) followed by looking at productivity issues of the major food grains, then the postharvest handling and value chain, and then finally training and capacity building. Other personalities of interest were: Dr Gebisa Ejeta, World Food Prize Laureate (2009), Dr Akin Adesina (Vice President of AGRA), and Chris Dowswell ,who diligently served Dr Borlaug for a period spanning over 32 years). The symposium addressed issues such as : Agriculture for what?, postharvest loss as a major challenge for smallholder farmers , climate change effects, gender, especially recognizing the fact that the most familiar profile of the African farmer is woman and smallholder, poor use of fertilizer, market access and agro-processing and nutrition. Most of this material will soon be posted on the symposium website which can easily be found through google. 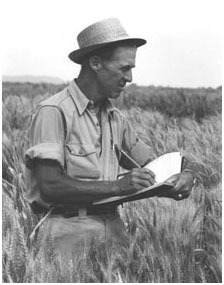 Dr Borlaug’s last words were: "take it to the farmer", told to a soil scientist who had come to explain a unique technique to replenish soil nutrients. He was born in Iowa, on his grandfather’s farm and walked to a one-classroom school to be taught. How different is that from the rest of us? He had a vision which we can emulate, surely and do something to save our people from hunger. 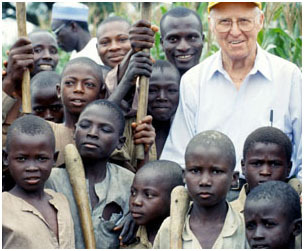 Many of us leaders in Africa have more than Dr Borlaug had in his childhood. Even though Dr Borlaug had hesitated to start work in Africa, giving his advanced age as a reason, it is clear that his 23 years in the four to six countries of focus has left a light and a spirit which we can use to guide our passion to work. Coincidentally, the African Union summit which started in Uganda on July 17, 2010 is to address various issues, including health, infrastructure and food security. This is the first time the summit will address food security and nutrition. A youth forum on maternal and child health kicked off the event. The Forum organizers have courageously decided to go on despite the twin bombings a week back that killed more than 70 people in Kampala, the capital city of Uganda. It would be nice to see our African leaders support food security and nutrition, and strive to save our children from the indignity of malnutrition and hunger. 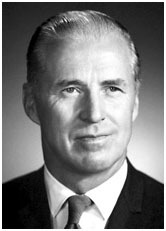 This year, Dr Borlaug’s name will continue to come up at various events across the globe; one could say his spirit is not happy with all this on-going hunger that afflicts so many (now more than one billion people globally and especially children), something that always saddened him. Finally, Roger Thurow who together with Scott Kilman wrote the book ENOUGH published by PublicAffairs in the USA talked to us in Ethiopia over dinner, about the process of collecting material for the book, which focuses on 40 years of fighting hunger by the late Norman Borlaug. Forty years, and yet each day brings many more hungry people, in a world that has so much! !We should be outraged, Roger kept saying.